Have you ever watched a TV program about wildlife and wished you could go on a safari? See exciting animals up close? Well, you can! And you don’t have to leave home to do it, wildlife is all around us. I know you might not think your backyard is as exciting as a wildlife safari, but there is still plenty there to see that will amaze you. 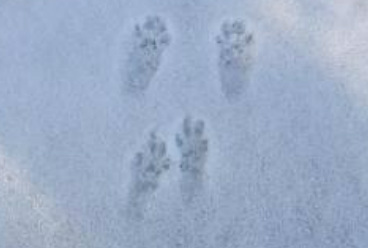 After a fresh snow fall, go outside and look carefully, you’ll see tracks in the snow. And if you follow them, you might be surprised to find that a critter or two is living quite near by. You’ll at least know that there are visitors to your yard each night! Winter snow makes tracks easy to see (but keep in mind, the sun quickly distorts the size, so early morning viewing is best). And spring will be here soon, with many opportunities to safari close to home. Watch for those migratory birds to start returning. One we all recognize is the robin, pulling worms from the snow-saturated ground. And then with warming days, start looking around where you saw spiders last fall, and look for their egg cases (they tend to look like pea sized fuzzy balls), they will begin to hatch out as the weather warms. Spring peepers (little frogs) will begin to sing, and before you know it summer will be back, with opportunities to spot birds building nests. Watch the trees where they perch in your yard and see if you can spot any nest building. No matter where we live, in urban settings or rural areas, animals need to make the most of whatever is available in order to survive. So, even land that is greatly altered by humans will still see animal activity. For example, you have probably seen great animal migrations across the plains of Africa on Animal Planet. Large animals, smaller animals, all traveling along as though on a highway that only they can see. Well, right here, close to home, we have animal highways, too! Large animals will travel distances along our actual paved highways, especially under cover of dark. Also, electric power lines run for hundreds of miles. This provides a ready made highway of sorts for animals needing to travel, since they are kept open - free of trees - so as not to interfere with the lines overhead. But from the ground there is still a lot of cover from high grasses and shrubs, which helps the animals to blend in. Even though these lands are by no means pristine, they allow large animals such as bear and moose to travel great distances when foraging for food or looking for a mate. And overhead there is another highway of sorts - a skyway - where migrating birds, bats, and butterflies travel great distances to seasonal habitation spots. Fall and spring are the times to watch for these migrants. And if you want to go on a micro-safari, in summer try watching ants. Drop a piece of something sweet (like a bite of fruit) on the ground and watch to see how long it takes for ants to arrive and begin transporting bits away to their colony underground. Wherever you look in your yard there is wildlife to watch. And just like those animals on Animal Planet, the critters in the yard are traveling, communicating, building, and mating - the whole circle of life! So, enjoy tracking animals in the snow this winter, and get ready for those spring migrations, because summer is right around the corner. Happy Safari.